Note: This section only applies when connecting to the computer via FireWire. If connecting to the computer via Thunderbolt, see the Thunderbolt Multi Unit Cascading article. Multi-unit cascading of two Apollo or Apollo 16 units together in one computer system is a compatible configuration as of UAD version 7.0. Combining Apollo with Apollo 16 in one computer system is an incompatible configuration. Three or more Apollo products cannot be combined in one computer system. 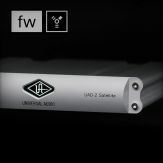 Concurrent use of up to two UAD FireWire devices (Apollo and/or UAD-2 Satellite FireWire) together in one computer system is compatible. 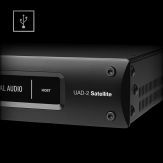 Therefore, UAD-2 Satellite FireWire cannot be used when multi-unit cascading two Apollo units. For all details and complete operating instructions with two Apollo units, see the "Multi-Unit Cascading" chapter in the Apollo Software Manual. 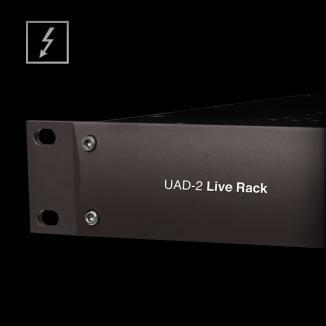 To facilitate Realtime UAD Processing and the mix bus integration within the Console Mixer when multi-unit cascading, one device must be designated as the monitor (master) unit and the other as the expander (slave) unit. In driver I/O list ordering, the monitor unit I/O precedes the expander unit I/O, and the expander unit I/O labels are preceded with "2" to differentiate from the monitor unit I/O. 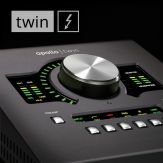 Monitor Outputs: When multi-unit cascading, both units share the same monitor mix bus. The monitoring speaker system must be connected to the monitor outputs of the monitor unit. 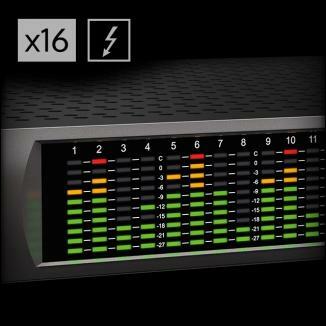 The monitor outputs of the expander unit are disabled. 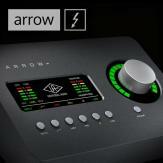 Monitor Knobs: The monitor knob on the front panel of expander unit, and its surrounding green LED ring, are disabled. 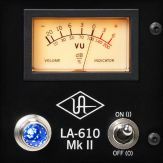 Use the front panel monitor knob on the monitor unit (or the monitor level controls in Console or the Console Recall plug-in) to adjust the monitor output level. 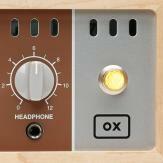 Aux, Headphone, Cue Outputs: When multi-unit cascading, the send mix buses of both units are summed and these buses are sent to the monitor unit only. 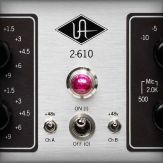 The associated outputs on the expander unit are disabled. Flex Routing: When multi-unit cascading, inputs in Console can only be directly routed (via Output menu) to hardware outputs of the same unit. 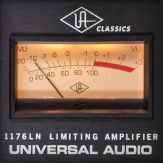 Multi-unit cascading is unavailable at sample rates of 176.4 kHz or 192 kHz. (Apollo only) Auxiliary bus 2 is unavailable when multi-unit cascading with Apollo. When the Apollo units are properly wired, all system clocking and clock settings are automatically configured by the device drivers. In the Interface panel of the Console Settings window, set the clock source to Internal unless specifically clocking to an external (non-Apollo) device. When the clock source in the Console Settings window is set to Internal, “EXT” will illuminate on the designated expander unit hardware’s front panel. When using an external clock with Apollo multi-unit cascading, both Apollo units are automatically configured by the device drivers to use the external clock when the Clock Source specified in the Interface panel of the Console Settings window is set to External. 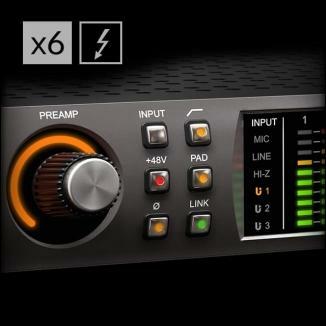 When the clock source in the Console Settings window is set to External, “EXT” will illuminate on the front panel of both the monitor unit and the expander unit. In all multi-unit cascading setups, specific hardware wiring connections are required. The specific connections differ for Apollo and Apollo 16. 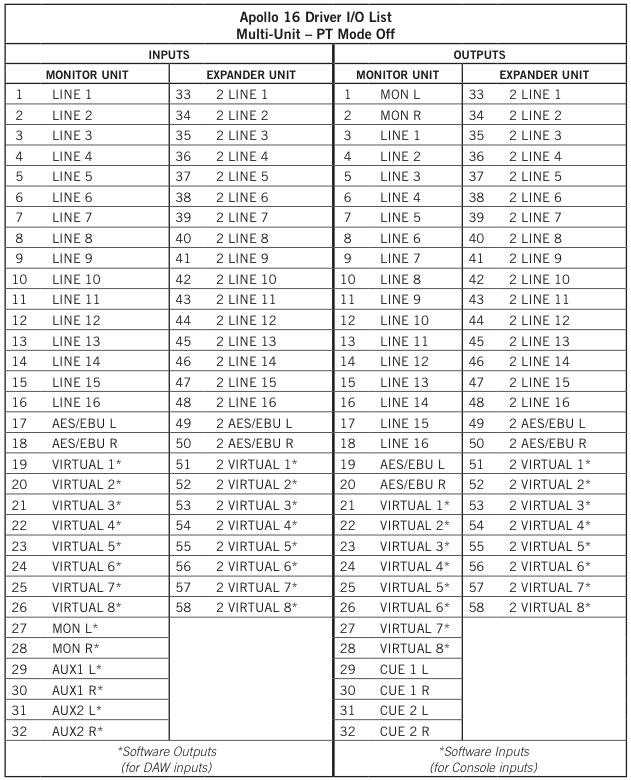 See the wiring diagrams below. Connect only the monitor unit to the host computer system. The expander unit is connected (daisy-chained) to the monitor unit only, not the host computer. 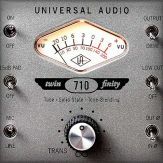 A FireWire 800 cable must be connected between the Expander and Monitor units. ADAT (Apollo) or MADI (Apollo 16) is required for the mix bus integration when multi-unit cascading. 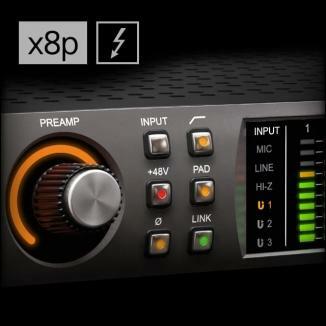 (Apollo) Both ADAT ports (S/MUX) must be connected when multi-unit cascading at sample rates of 88.2 kHz or 96 kHz. (Apollo) Monitor, headphone, and auxiliary outputs must be connected to the Monitor unit only. (Apollo 16) Monitor and cue outputs must be connected to the Monitor unit only. Wiring diagrams for both FireWire multi-unit cascading setups are below. When multi-unit cascading, the order in which the Apollo monitor and expander units are powered on is important for proper initialization. 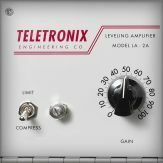 Note: The steps are critical when multi-unit cascading at sample rates of 88.2 kHz and higher. The specific inputs and outputs that are available to the DAW when multi-unit cascading depends on the model (Apollo or Apollo 16) and whether or not PT Mode is enabled. 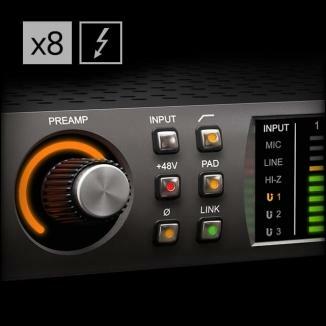 Avid Pro Tools allows 32 channels of I/O with non-Avid branded audio interfaces. 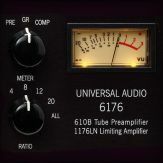 Because Apollo audio streams exceed this count when multi-unit cascading, some Apollo I/O channels are unavailable in PT Mode when multi-unit cascading. Enabling PT Mode changes the driver I/O complement. Quit all audio applications before changing the PT Mode setting. PT Mode changes Apollo’s driver I/O numbering and names. If a DAW project saved with PT Mode disabled (or saved prior to UAD v7) is subsequently opened when PT Mode is enabled, the DAW’s channel I/O assignments may need to be adjusted in the Pro Tools I/O Setup window. 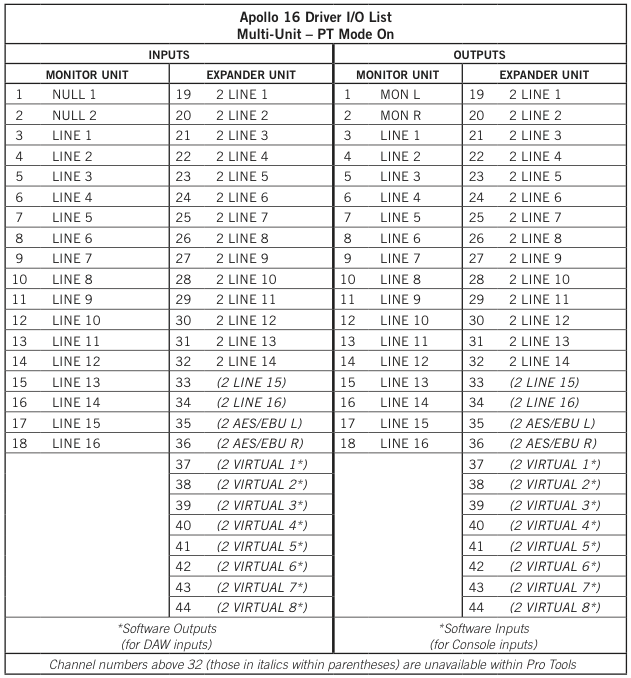 The specific driver I/O complements for all available multi-unit cascading configurations are listed in the driver I/O tables below. 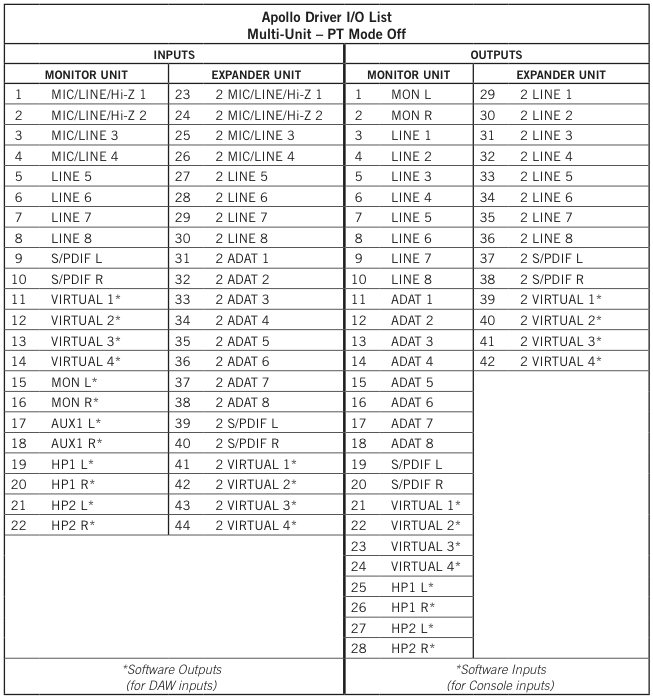 In the multi-unit I/O driver tables, the designated monitor unit I/O is in the left columns and the designated expander unit is in the right columns. 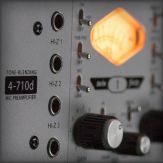 In the tables and the driver I/O labels, the expander unit I/O is prefixed with the number 2 (e.g., “2 LINE 1”). 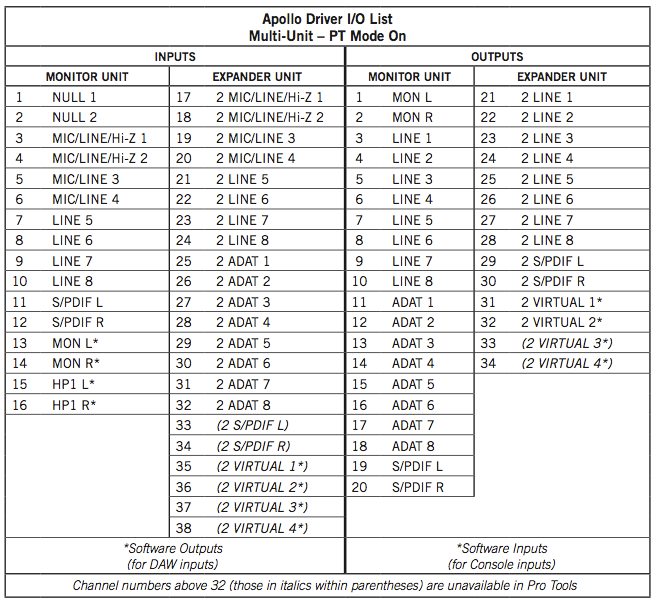 Note: All Apollo driver I/O tables are available in the Apollo Software Manual.